Every design requires a careful approach that is based on psychological principles—understanding what makes your audience tick, what emotions a certain design choice can elicit, and how people are going to behave according to what they see. And this, of course, relates to logo design as well. A lot of people think that designing a logo is a piece of cake. They’re mostly thinking about the colours or maybe the typeface they’re going to use. But there is so much more to the psychology of logo design. Your logo is tightly related to your brand’s image; it’s your company’s visual representation, which your audience is going to recognize and relate to. There is an important lesson here that you need to learn: Every element you put into your logo will have a psychological effect, whether it is your intention or not. Let’s talk about the term “logo.” Logo comes from the Greek word logos which means “word.” Basically, this means when you design a logo, you are coming up with a visual word that is going to convey a message to your audience and make them relate to it. Just like they relate to words, they’ll do the same with your design, from their own experiences and perspectives. Different shapes have different effects on your audience. Throughout history, certain geometrical objects have gained particular meanings. This means that your choice of the shapes that you use in your logo design will convey a particular message to your customers. For example, circles are well-known for representing community or femininity; triangles are most commonly associated with law, power, and masculinity (if they are turned upward); rectangles tend to represent logic and rationality, and so on. Before choosing a shape for your design, do your research on what it represents and what kind of message it will convey. If your products are focused on a female audience, incorporate a circle or a downward triangle; if your customers are generally men, go for an upward triangle. Yellow: The colour of youth, happiness, and energy. It’s the best choice if you want to look friendly and approachable to your audience. Red: The colour of passion, excitement, and also anger. If you want your brand to be bold and “in your face,” then red is the colour you should go for. Green: It’s generally connected to nature, life, and preservation, and it can be applied in a variety of creative ways. Blue: The most frequently chosen colour, due to the fact that it has a calming effect and conveys a message of trust and professionalism. Purple: An interesting and luxurious choice. Different shades of purple can be either enigmatic, feminine, or eclectic. Pink: Definitely a very feminine colour, but if you go for a shade such as a pastel rose or neon magenta, you can add a little maturity to it, while still appealing to girls. Black: A smooth and modern colour that speaks of luxury. If you are going for a minimalist approach, then a black and white logo is the perfect solution. White: A neutral colour that works well with others. As previously mentioned, it can be incorporated into a minimalist design, but also works well with other colours to convey a feeling of cleanliness and youthfulness. Just like colour and shape, the choice of typography enhances and gives your logo a certain feeling. There are four basic kinds of fonts that you can choose from to come up with a logo that is one-of-a-kind and conveys the message that you want it to. Serif fonts: These are the fonts that give your logo a sophisticated and classic feel. Basically, serifs are those little “feet” that you can see at the end of each letter, which make such typefaces look more vintage. If you are aiming for an old-fashioned, classic, or elegant design, serif fonts are for you. Script fonts: A script font looks like it’s been handwritten. There are a wide variety of such fonts out there, from more common scripts to calligraphic fonts that speak of elegance. These fonts are a good option for coming up with a unique logo. Sans serif fonts: As opposed to serif fonts and their “feet,” sans serif fonts look a lot simpler, and work well in clean and modern designs. If your goal is to come up with a minimalist design, then you should pick a sans serif font. Display fonts: They are very stylized and have decorative features. If you want to create a logo that attracts a certain kind of attention, then a display font may be a good choice for you. Furthermore, you can really boost the power of typography by combining different fonts. Just don’t go overboard and make your logo a mismatch of styles that comes off as a complete mess. It’s essential that your font is readable. No matter whether you have chosen the right shape, colour, and typography, if a person can’t properly discern your logo, or it simply comes off as a mess that doesn’t fit with your general aesthetic, design, and message, then it will be of no use to you. So don’t get too carried away when designing your font. The majority of your audience will not spend time trying to tell what is written on your logo and what it represents. Your font needs to be coherent, simple enough, and discernible, in order for it to have the right effect. Also, if you need help with your design, don’t hesitate to take advantage of one of the tools available on the internet. Your logo represents your brand, so it isn’t something that you can just design in a rush. 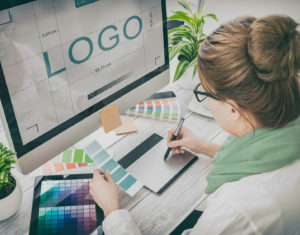 Carefully choose each of the elements that go into a logo—shape, colour, typography—so it conveys your company’s message and invokes the right feelings with your audience.